Michael Smith directs the Concordia Choir during their performance at one of the symposium plenary sessions. Photo by Maddie Malat. This year, Concordia Choir bids a temporary farewell to a beloved colleague and conductor and welcomes an old friend. Dr. René Clausen will be taking time off this year to focus on his own projects while Michael Smith returns for his last year as a conductor but his first time conducting Concordia Choir. “I really feel like I was called here for this year,” Smith said. Clausen has taken time off in order to focus on some special projects he has been assigned for this year. According to Dr. John Roberts, Professor of Music and Chair of the Department, the Reformation Celebration, commemorating the 500th anniversary of the birth of Protestantism is coming soon and President Craft has invited him to write an oratorio for the Concordia Choir to perform. An oratorio is a very large composition for orchestra, soloists and the choir, that will require a great deal of dedication from Clausen. According to Roberts, in face of Clausen’s time off, the Concordia Choir will not be traveling internationally until next year, but will have the chance to travel nationally with Smith. When looking for a replacement, Roberts and Craft relied on the opinions of Dr. Clausen and the music faculty to determine the best candidate for the job. Based off of their response, Roberts decided that Smith was the perfect fit. Isaac Lovdahl, vocal music education major, was a freshman in the men’s choir when Smith was here during his last year and first met Smith in a meeting during the college’s music scholarship program. Smith was one of the people that had convinced Lovdahl to come here. “He is so full of life. You just always leave a conversation with him with a smile on your face,” Lovdahl said. According to Smith, before he conducted at Concordia, he was a high school conductor at Aitkan, Wilmar and Brainerd for 25 years. After conducting for so many years, Smith had decided on retirement. Yet, shortly after retiring, he obtained a conductor position at Concordia. Six years later he returned to retirement only to find himself back at Concordia for one last year. After this year is over, Smith is pretty certain he will stay in retirement. “I don’t think I am going to flunk retirement for the third time,” Smith said. Smith felt inspired to accept this job offer for various reasons. He loves the Concordia family, the mission that the college upholds and he especially loves and missed the students of Concordia. Coming from a strong, educational background, Smith presents some differences in his techniques and style as a conductor. While Roberts believes Smith’s background in high school education will give him the opportunity to help music education majors know how to interact with that age, one of his past students noticed something different. Sally Pigeon, English Literature major, was an alto two in Cantabile choir when Smith conducted in the past. She noted that while Clausen focused on voice blending and sound, Smith was more technical in his teachings. “I told the choir I am not René Clausen, but I come with certain gifts too that I hope to share,” Smith said. Noting Clausen’s smooth motions when he conducts and his focus on voice, compared to Smith’s rigid hand motions and technical approach, Pigeon hopes that her and her fellow students can learn about what matters most. “The differences the conductor makes [in the choir] does not have to be the most important thing,” Pigeon said. She believes that the differences that Smith may make as a conductor aren’t necessarily bad because what’s most important is the process to creating meaningful music. “Anyone who can help us get there is worth listening to and working with,” Pigeon said. Smith and Clausen also exhibit a few similarities due to their similar musical backgrounds. Both graduates of St. Olaf and students of the same music teacher, they share similar vocal concepts. 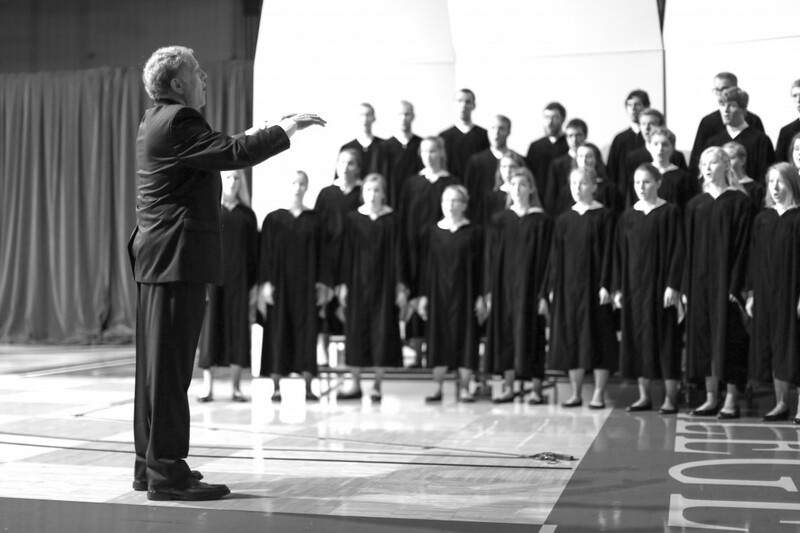 Products of the Lutheran Christianson Choral tradition, they focus on a singing quality that connects with the audience. In face of this year’s position, Smith feels great excitement in what lays ahead. He is excited to make great music and to meet his students. Yet, Smith has also felt a healthy amount of pressure taking on this position as well. Clausen was getting the time off he deserved, and once it was announced that Smith was filling the position, Lovdahl was elated and relieved. Some of the expectations that Pigeon has for Smith is not only that he continues the choir’s excellence, but that he is present in the moments the choir shares and that he fosters the close relationships within the choir as well. Along with these expectations, Pigeon also expects Smith to learn something as well.